It’s a scientifically proven fact that exercise helps your sleep cycle. However, the increased adrenaline, raised body heat and heart rate elevation caused by exercise can actually make it harder to sleep! To get the bet of both worlds, exercise at least three hours before bed. Aromatherapy has been used for centuries to promote better sleep. The fragrances of Lavender, Vanilla and Jasmine have proven to be especially effective at making it easier to fall asleep and achieve uninterrupted rest. Simply dab the essential oils on your pillows or scatter scented candles throughout your room. Your bedroom should be a relaxing place, ready to soothe you to sleep. Remove any stressful items from the room, such as work files, your laptop or even your phone to ease anxiety before bed. If you find yourself still lying awake at night, try removing any clocks from the room as they can be a common stress trigger. It’s proven that we sleep better in dark rooms, thanks to our body’s built in circadian clock. Try dimming the lights and turning off electronics half an hour before bed to let your body know it’s time to prepare for rest. To stop yourself from waking up with the sun, invest in black out blinds for a peaceful night’s sleep in the Summer time! Caffeine stimulates brain activity, making it hard to unwind and fall asleep. It takes about five to six hours for even half of a cup of coffee to wear off so try limit caffeine to the first half of your day. Don’t forget to check the ingredients of any medication to ensure you’re not unknowingly imbibing it! Fatty foods and large portions of protein take longer to digest, meaning they make a poor midnight snack. They sit in your stomach, making it harder to fall asleep and can leave you feeling sluggish the next morning. Instead try small portions of high GI carbohydrates, like oatmeal or brown bread. These will stabilise your blood sugars and mood, making it easier to relax into sleep. While it can be tempting to pile blankets on the bed, studies have shown that the ideal temperature for sleep is around 18.5 degrees Celsius. This is because when we go to sleep our body temperatures lower as a natural response to the decreased activity levels. To maintain a comfortable temperature, choose foam pillows and cotton sheets, to allow air to circulate throughout your bed furnishings. While it can be comforting or easier to share your bedroom with your pets, it’s not conducive to getting a good night’s sleep! 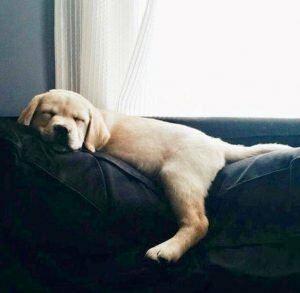 Their movements can disturb your sleep and their fur can make it harder for those with sleep difficulties related to breathing. Stretching our muscles before bed not only improves our flexibility but it helps to relax our bodies and ease muscle tension from the day. This is proven to help us find a comfortable resting position and drift off to sleep quicker! Being tired throughout the day can affect your sleep quality at night-time. Those who feel exhausted are more likely to disrupt their sleep schedule, take extended naps or drink too much caffeine. The most common cause of this is dehydration! You should aim to drink around 2 litres of fluids a day, without counting caffeine of sugary drinks, as these can actually make you thirstier.